After a 17-day struggle, an image of the Thai boys flashing victory sign, smiling and waving from their hospital beds gripped the world. The boys would have to stay in hospital for up to 10 days, hospital director Chaiwetch Thanapaisal told the news conference. "Everyone is strong in mind and heart". Parents watched and waved from behind a glass barrier, their faces vivid with emotion. "It might be because they were all together as a team, helping one another out", public health ministry inspector-general Thongchai Lertwilairatanapong told reporters, singling out their 25-year-old coach for keeping their spirits high. Two of the first group had a lung infection as well, and Thongchai said they would need medicine for seven days. Released on the Thai Navy SEALs Facebook page, the clip showed the boys being stretchered to freedom while wearing wetsuits and diving gear. The extraordinary operation to save the boys came to an end on Tuesday, when the Thai Navy SEAL rescuers and a doctor followed the last four boys and their coach out of the cave complex. According to reports, all 12 boys of a child soccer team and their assistant coach have been rescued and evacuated to a hospital, 13 members of a youth soccer team including their assistant coach have been trapped in Tham Luang cave since 23 June 2018. The three Australian divers stationed at "chamber three", a base inside the cave, said they heard screaming and saw a rush of head torches from deeper inside the tunnel as workers scrambled to reach dry ground, the Guardian reported. The complex mission for global and Thai divers to guide the boys and coach through the cave's flooded and tight passageways riveted people worldwide. "As you can imagine from what's been in the media all week it is not a holiday that Harry has been on", Pearce said. "The divers carried them out and they were wearing wetsuits to keep them warm", Thai navy SEAL chief Apakorn Youkongkaew said. The unprecedented mission was completed on the 18th day of an all-out rescue effort involving several countries from around the globe. Relatively mild weather and a massive effort to pump out water created a window of opportunity. "They are children being children, it was an accident", Narongsak said. 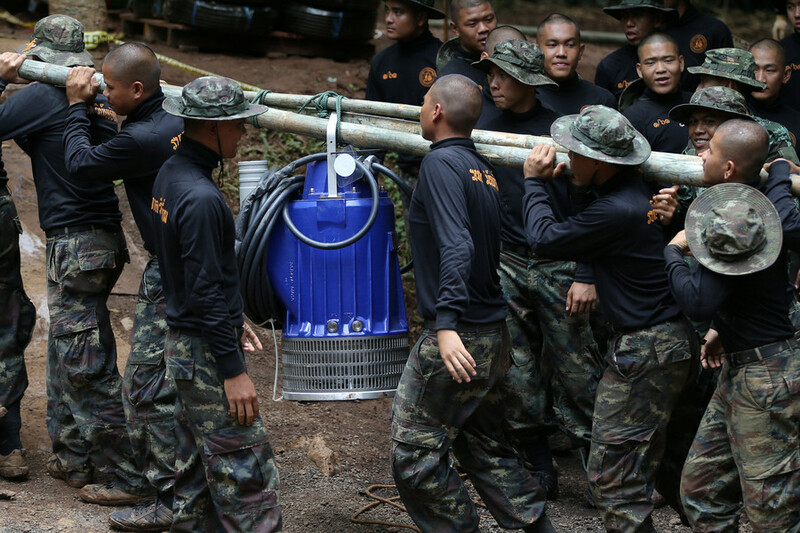 Most of the boys rescued from inside a flooded cave in northern Thailand lost an average of 2 kilograms (4 pounds) during their ordeal, but were generally in good condition, a senior health official said on Wednesday. Although the boys were found safe, the water levels and complexity of the cave system meant rescuers weren't able to retrieve the first four boys until July 8, more than two weeks' after they went missing. Is the Trump Administration at War with Breastfeeding? At the conference, Ecuador sponsored a proposal that recognized mother's milk as the healthiest option for nursing newborns. Taking a break from being an all-purpose bogeyman, Russia, we're told, saved the day and the United States was thwarted. Columbus police have not confirmed any arrest, and neither have Siren's Gentlemen's Club. CNN has reached out to the Columbus Police Department for additional information. Kim Jong Un put potatoes ahead of Mike Pompeo during a USA visit to agree denuclearisation details, state media has suggested. North Korea said Pompeo's trip went "as badly as it could have gone", CNN's Will Ripley quoted a source as saying . The reigning NL MVP won't be participating for the AL squad in the All-Star Game next week in Washington. In addition, Segura is the first Mariners player to ever come out on top of an All-Star Final Vote. As a strong proponent of diplomacy, I believe a meeting between President Trump and President Putin could be a productive one. The Guardian quotes her as saying, "I have experienced myself how a part of Germany was controlled by the Soviet Union". Up to 50,000 people are expected to descend on the capital, with around 10,000 cops on the ground. The Jameson in Hammersmith has rebranded itself The Trump Arms for the US President's visit. Matt Reece, 25, who works in marketing, said England had far outperformed the low expectations of them when the tournament began. England must now rouse themselves for the finale of the third-placed play-off against Belgium in St Petersburg on Saturday. Later he was part of Bush's legal team working on the 2000 Florida recount, which resulted in Bush's winning the presidency. Kavanaugh say that a president should not be subpoenaed, he said a president shouldn't be investigated", Schumer said. Narongsak Osottanakorn, head of the rescue operation, said a team of divers went back into the cave Monday morning, local time. It's the news the entire world has been waiting more than two weeks to hear. "Four plus one coach , so it's five". Princess Diana's favourite flower was the white rose - leading many to think Kate was making a subtle nod to her. Prince Louis has been christened during a 40-minute service at the Chapel Royal at St James' Palace in London . But the squad that England fielded in 2018 seemed like a completely different team, despite comprising numerous same players. In the semi-final, with the help of some timely rain, he came from two sets to one down to beat Briton Tim Henman. The company is actually expected to launch a basic version of its next flagship in addition to the Galaxy S10 and Galaxy S10 +. The top variant of the S10 is said to feature a triple camera setup, according to some render leaked today on the internet. Of Nato's 29 members, just five meet that target this year: the US, Greece, Estonia, the United Kingdom and Latvia. Nato's secretary-general said the primary focus should be on all members reaching the current target of 2%. Knight was a basketball operations assistant for the Northern Arizona Suns of the developmental G League in the 2016-17 season. A Los Angeles native, Knight played for the Bruins from 1997 to 2002, averaging eight points and two rebounds per game. A post-mortem examination of Ms Sturgess, from Durrington, is due to take place and her family has been informed, police said . Scotland Yard has begun a murder investigation after Ms Sturgess died in hospital yesterday evening.